Presented here with the permission of the author. 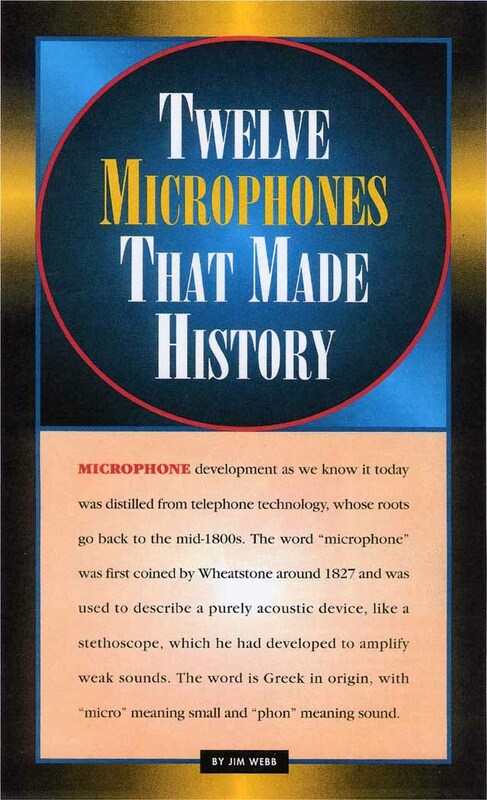 Microphone development as we know it today was distilled from telephone technology, whose roots go back to the mid 1800s. The word “microphone” was ﬁrst coined by Wheatstone around 1827 and was used to describe a purely acoustic device, like a stethoscope, which he had developed to amplify weak sounds. The word is Greek in origin, with “micro” meaning small and “phon” meaning sound. It was not applied to telephone devices in general, which were instead called “transmitters,” a practice continued by Western Electric almost until it ceased professional microphone production in the 1940s. The following list reflects my choice of twelve landmark microphones, some in a series, that had a significant influence on the audio profession and related arts though their unique designs. The mics shown in this article are part of a collection of some ﬁve hundred microphones, accumulated over a twenty-ﬁve-year period through trade and purchase. It is the second-largest collection in the country, and all of them have been restored as much as possible to their original factory working condition and appearance. In the early 1920s, the demands of broadcasting led Western to develop a more stable and better-sounding carbon transmitter. The push-pull designs of the 369 and 373 models in their ring mounts and eye-catching protective cages were a big step in this direction. A double-button mic even found its way into President Warren G. Harding’s Inaugural Address in 1921. By the mid twenties, the 387 model, with its gold-sputtered diaphragm of 0.0017-inch-thick duralumin, would embody the best of the push-pull designs. It was followed by the slightly improved model 600 in the early thirties, and the double-button became recognized worldwide as a standard in broadcasting. The development of E. C. Wente’s condenser and later the moving coil and ribbon microphones would replace the noisy carbon, reducing it to communication status in later years. The idea of a condenser transmitter had been around since the early days of telephone technology, but its high impedance and low output had made it impractical for early use. The 1915 development of the vacuum tube ampliﬁer solved the impedance and output problems, and in 1917, E. C. Wente of Bell Labs developed the ﬁrst modern condenser microphone. Early models of the mics were not reliable, and they were held aside mostly for acoustic research. By the mid twenties, improved condenser models began appearing, and by the late twenties, Western Electric had produced six different models of condenser mics: the 7A and 9A “mantle clocks,” the 8A and 10A floor stand models, and the hanging cylinder models of the 47A and 53A, all incorporating Wente’s famous 394 condenser transmitter head with its aluminum alloy diaphragm. American-made condenser mics pretty much faded from the market by the mid thirties. In early 1931, Western Electric marketed its 618 electrodynamic transmitter—the ﬁrst dynamic microphone. The moving-coil idea had been around since the late 1800s, but the vacuum tube ampliﬁer and the cobalt permanent magnet material combined to make it a reality. In an audio world populated with noisy carbons and largely troublesome condensers, both of which required power supplies to operate, the 618’s claim of a small, trouble-free microphone was an instant success. In the mid thirties, Western updated the concept with the classically designed 630A “8 Ball.” The dynamic mic went on to become one of the mainstays of American microphone production. In the late 1920s, Dr. Harry F. Olson of RCA began development of the ribbon microphone, ﬁrst with ﬁeld coils and then with permanent magnets. In 1931, some nine months after the introduction of Western’s 618 dynamic, RCA marketed its ﬁrst permanent magnet bi-directional ribbon microphone, the 44-A. The smooth sound of the ribbon and its eye-pleasing styling made it a staple of broadcasting well into the 1940s. The design was updated with improved magnet material in the mid thirties, and the 44-B/-BX went on to become one of the classic influences in microphone technology, staying in production until the mid ﬁfties. This quality ribbon microphone is still in demand today and has one of the most recognizable shapes in the world. In the early 1930s, Dr. Olson, realizing the need for a directional mic, developed the 77-A unidirectional. Its round shape would migrate through seven different models. The A, B and C models utilized double ribbons combining a pressure unit with a velocity unit to achieve the unidirectional pattern. Improvements in magnet material allowed a signiﬁcant reduction in size starting with the B model. The C and D models were capable of multiple patterns. The 77-D and DX single-ribbon models produced after World War II were arguably RCA’s most successful microphone, staying in production until 1973, when all RCA microphone production ﬁnally ceased. Graphic artists routinely depict its widely recognized shape to indicate public speech. This mic can still be seen today on the Larry King and David Letterman shows. In the late 1930s, Western Electric, drawing on ribbon technology for the ﬁrst and only time, produced the ﬁrst switchable multi-pattern microphone, combining its well-respected 630A omni-directional dynamic unit with a uniquely crimped bi-directional ribbon assembly. Its output impedance, as with all previous Western mics (excepting condensers), was 50 ohms. It offered a selection of R (ribbon/bi-directional), D (dynamic/omni-directional) and C (cardioid or combined pattern). The 639B added another three variations of the combined pattern for a total of six patterns. In the early forties, Electrical Research Products Inc. (ERPI), a division of Western, redesigned the acoustic cage of the 639 for motion picture use, designating it as the RA-1142 transmitter. The Shure Unidyne’s history dates back to 1937, when Ben Bauer began searching for a way to make a much simpler and more reliable directional mic using a single element. Bauer found that by utilizing time delay networks on sounds arriving at openings at the back of the mic (“uni-phase,” as Shure called the system), he was able to achieve controlled cancellation and produce a cardioid pattern. In 1939, Shure introduced the Model 55A (30-50 ohms), Model 55B (200-250 ohms) and the high-impedance Model 55C. In the forties, Shure added the shock-mounted broadcast models 555 and 556. The small Unidyne was introduced in 1951. It is hard to imagine another microphone based on its original concept and styling that has remained in production as long as some version of the Unidyne. I believe its styling is one of the three most recognizable microphone shapes ever created, the other two being the RCA 44 and 77. The 640A/AA condenser mic came about from Western Electric’s need for a reliable calibration mic and the conclusion that the 394 condenser was too big and bulky to do the job. In 1932, a miniature condenser microphone system with a one-inch diaphragm called the D96436 was successfully tested and re-designated the 640A. In 1942, Bell Labs’ testing of the 640A revealed it to be susceptible to changes in ambient temperature, pressure and relative humidity. They changed the capsule diaphragm material from aluminum alloy to highly corrosion resisting steel and changed other internal components to lessen this effect. They re-designated this capsule as the 640AA. The 640AA was the mainstay calibration mic of anyone involved in serious audio work, including such entities as RCA, Altec and, of course, the National Bureau of Standards. Western Electric eventually decided that with the small demand for calibration mics, it would be better to buy them as needed rather than making them. They turned over the manufacturing of calibration mics to Brel Kjaer, which constructed the 4160 to meet Western Electric needs. Once the 4160 was in production, 640AA capsules ceased to be made. Georg Neumann and Co. was formed in 1928. Neumann produced his ﬁrst condenser mic, the CMV3, which had an REO84K triode ampliﬁer and a pressure-omni capsule (the M1/M2) made from hand-cast, gold-plated PVC. Very early diaphragms were actually made from a resin dissolved in alcohol cast on water. Eventually, PVC was dissolved in amyl acetate and cast onto gold-dusted plates. In 1932, Neumann produced a variation of the CMV3 (the CMV3A) that enabled the user to attach different condenser heads. Using an idea patented by Braunmuhl and Weber in Germany in 1927, Neumann developed the double-membrane capsule with a shared backplate. In this backplate were 153 precisely hand-drilled and critically placed holes, some of which went through the back side. A cancellation of sound reaching the rear of the capsule was produced, resulting in a cardioid pattern. This capsule was designated the M7. The so-called “bottle” condenser, with its M7 capsule, became the ﬁrst cardioid microphone. The ﬁrst microphone to have “directional” characteristics to it was Olson’s bi-directional ribbon, designed in 1929-30. The M8 bi-directional and M9 omni-directional capsules were soon added. The M7 capsule design has been in continuous production from its inception to the present. Its influence on modern condenser technology is unparalleled. An updated version of the CMV3A bottle made by B.L.U.E. Microphones is in production today. After World War II, Neumann regrouped his company and developed the U 47. It was ﬁrst marketed in June 1948. Distribution was by Telefunken, which promptly put its name on the ampliﬁer housing. The U 47 was the ﬁrst switchable-pattern condenser microphone switching between cardioid and omni-directional patterns. It incorporated the highly successful 12-micron-thick M7 capsule and VF-14 tube ampliﬁer, which was a metal-clad pre-World War II pentode conﬁgured to work as a triode. The hand-selected VF-14s had a 55-volt ﬁlament that operated at 36 volts for longer tube life and quieter operation. In the early 1950s, Mercury Records touted the U 47 as its “Living Presence” microphone, putting pictures of it on record jacket covers. In 1956, thanks to the development of smaller capacitors, Neumann was able to reduce the length of the mic by almost three inches. The capsule ﬁnish was also changed from chrome to matte, matching the rest of the microphone. The U 48, a cardioid/bi-directional version, was marketed in 1956. Two years later, Neumann took over distribution of its own products from Telefunken, restoring the Neumann logo. Gotham Audio became its North American distributor. In 1960, Neumann decided to update the U 47 with the U 67, which was originally called the U 60 but later re-designated to indicate its ties to the U 47. The U 67 capsule design was switched from PVC to Mylar ﬁlm, and a tensioning ring with screws (rather than glue) secured the membrane. Long-standing problems of proximity effect and overload during close work were resolved with a clever internal 40-Hz cutoff ﬁlter and an ampliﬁer pad switch allowing the choice of close-up or distant use. A three-pattern switch was added for extra versatility. An effort to minimize capsule resonance was made with a new tapered capsule windscreen, and the modern EF 86 tube allowed for a more streamlined, tapered body design. This particular shape remains not only in Neumann’s line of microphones, but in other lines of competing microphones today. In 1949, Dr. Herbert Grosskopf of the IRT (Institute Fur Rundfunktechnic, a German-based technical standards and design organization established after WW II by German broadcasters) designed and patented the ﬁrst electronically remote-controlled variable pattern condenser microphone, the M 49. This design was given to Neumann for manufacture, and Neumann incorporated its well-established M7 capsule into the mic. The IRT also wanted to establish a standard tube ampliﬁer for all German broadcast mics and a special low-noise, hand-built tube; the Hiller MSC2 was developed for this purpose. Telefunken manufactured the ﬁnal version of this tube as the AC701K, and eventually, all condenser tube microphones in the German broadcast system used this tube. The “M” designation before the model number indicated the standard AC701K ampliﬁer, while the “U” designation indicated other tube ampliﬁcation. The unique taper of the windscreen grille shows a major effort to address the influence of grille resonance. The M 50, a look-alike twin of the M 49, shares the design shape and the AC701K tube, but it is strictly a pressure microphone designed for distant orchestral mic work. Its small pressure capsule evolved through three separate diaphragms, ﬁrst with PVC, then aluminum (the same as the KM53), and ﬁnally with gold-sputtered Mylar. The diaphragm was flush-mounted in a plastic sphere designed to allow the capsule to respond with some directional characteristics in the frequencies above 1 kHz while still maintaining an omni-directional characteristic at the lower frequencies. An additional +5 dB of high-frequency boost was added in the AC701K tube ampliﬁer circuit, resulting in a favorable overall frequency response when the mic was used at a distance from its source. AKG, which stands for Akustische und Kino-Gerate (Acoustic and Film Equipment) was formed in 1947 in Vienna, Austria. AKG developed the C-12 condenser microphone in 1953 based on a dual backplate/dual-membrane idea patented by Kalusche and Spardock in 1951. The modiﬁed version of this idea became the basis for the CK-12 capsule. AKG was the ﬁrst to manufacture a split electrode microphone. The original capsule membrane was 10-micron-thick PVC, which was later changed to 9-micron-thick Mylar. The ampliﬁer design was based on the 6072 tube, and the C-24 stereo edition of the mic with two CK-12 capsules utilized this dual triode to its full extent. The C-12, like the M 49, had a remotely controlled pattern selection from omni to bi-directional via the selector switch located in a box between the microphone and the power supply. The C-12 remained in production until 1963. In 1964, the C-12A appeared with a 7586 Nuvistor tube ampliﬁer and a physical shape foreshadowing the design of the 414 Series. In 1959, after the U 47 had been withdrawn from Telefunken distribution, Telefunken commissioned AKG to develop a large-diaphragm condenser microphone. This became the ELAM 250. This design incorporated the CK-12 capsule in a wider body with a thicker wire mesh grille. A two-pattern selector switch (cardioid to omni-directional) was placed on the microphone. The ELAM 251 added a third bi-directional pattern to the switching arrangement. The “E” designation after the 251 indicates export, incorporating a 6072 tube ampliﬁer. Non-E designations indicate the standard German AC701K tube ampliﬁer. The immense popularity of the C-12 and ELAM 250/251 microphones has made them the most expensive and highly desirable vintage tube mics on the market today. Sound Mixer Jim Webb won an Academy Award for his work on All the President’s Men. His microphone collection includes a variety of line standards from Western Electric and RCA, along with rare RCA Princeton Lab prototypes.